Got a bumper crop of fresh zucchini? 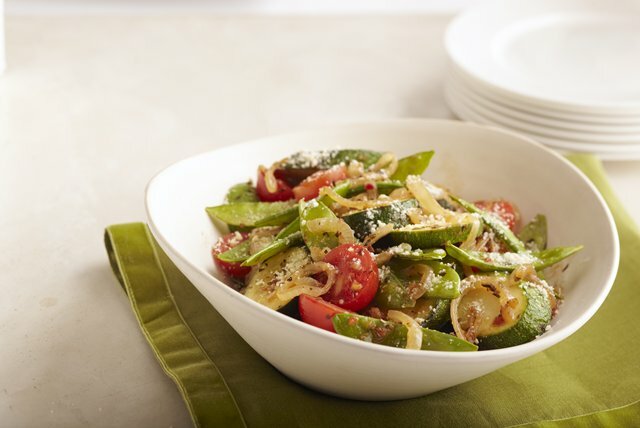 This quick vegetable side dish uses summer-fresh zucchini, crisp snow peas and juicy tomatoes. Stir-fried vegetables have never tasted so good. Heat dressing in large skillet on medium-high heat. Add onions, garlic and seasoning; cook 3 min., stirring occasionally. Add zucchini; cook and stir 4 to 5 min. or until crisp-tender. Stir in snow peas and tomatoes; cook 2 to 3 min. or until heated through, stirring occasionally. Substitute 1 lb. (450 g) Japanese or other small eggplant slices for the zucchini. Just cut the eggplant lengthwise in half, then crosswise into 1/4-inch-thick slices before adding to the cooked onions, garlic and seasoning. Here's a tasty new way to enjoy your vegetables. And as a bonus, it can be part of a healthy eating plan.